Over the past year, 47 business outcomes studies were conducted for clients across multiple industries, including retail, healthcare, transportation, telecommunications and more. 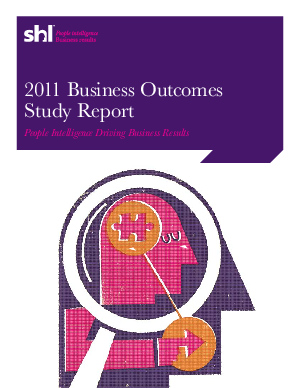 Extracts from these reports have been compiled in the 2011 Business Outcomes Study Report. The report is designed to demonstrate the value of online talent measurement solutions against metrics specific to the goals of each client organization. Findings in this report indicated there is a direct link between employees' capabilities and their performance on key business outcomes. As a result, it is critical to ensure that new hires and current staff members have the right mix of skills and abilities to be successful. In today's business environment, organizations around the world must demonstrate the business value of their People Intelligence programs - programs designed to generate specific and objective insights into people's ability and potential to perform. Our fifth annual Business Outcomes Study Report provides tangible proof that bottom line business results can be directly correlated to the People Intelligence that assessment tolls provide to inform decisions about talent.